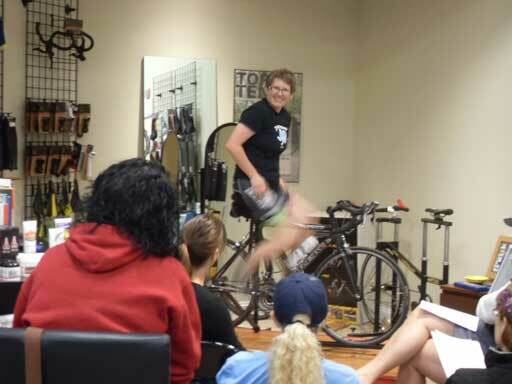 Fall Women’s Road Clinic | Home of the Crofton Bike Doctor Blog! We had a great time this past weekend at our Women’s Road Clinic! The clinic was led by Michelle and Britni, and the participants ranged from beginning cyclists to women with multiple years of road riding experience. The first part of the clinic covered clipless pedals and how they can make a rider safer, more efficient, and more powerful on the bike. Next, the participants learned about shifting and how to choose the appropriate gearing and cadence for a given situation. The last part of the clinic covered group riding etiquette, and then concluded with a demonstration on changing a flat tire. Thanks to all our customers for coming out! We plan on doing another clinic in the spring and will be doing some women’s specific rides occasionally this fall before the cold sets in. Want to stay abreast of all the fun things happening at the store? Be sure to like us on Facebook or join our e-mail list.